So, I’m watching The Librarians on TNT, which is similar to Warehouse 13, except with more well-known actors. It’s based off a series of TV-movies starring Noah Wyle as the Librarian, a person tasked with gathering dangerous magical artifacts so they are not misused by others. 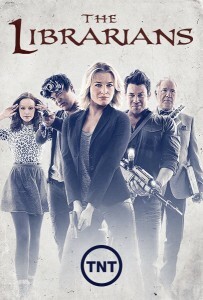 The new series does not feature Wyle, whose character has gone off to deal with the Big Bad, while leaving junior Librarians to deal with the everyday business. This week’s episode featured the Golden Axe Corporation, which gains its success by sacrificing their interns to the minotaur that lives within a magical labyrinth, an ability powered by a large collection of Minoan artifacts all metaphorically bound by a giant ball of string as per the legend of Theseus and the Minotaur. 4000 years ago, the Minoans were a major sea power in the eastern Mediterrean. Based on the island of Crete, they had no notable military. What is did have was a vast trading network and alliances with the bigger powers which found access to that network beneficial. Then, in about 1500 BCE, they vanished. Archeology suggests the last straw was an invasion by the Mycenaeans, a very warlike culture living on the Greek peninsula. But the Minoans appear to have already been weakened by that point, possibly by the explosion of the nearby Thera volcano about 100 years earlier, one of the largest known historical eruptions. We don’t know what they called themselves, for while they did have a written language, we haven’t figured out how to read it. So we call them Minoans, after the legendary King Minos who, according to the Greeks, lived on Crete (and fed virgins to a minotaur). By the time the Greeks (who developed much later than the Mycenaeans) knew of Crete, it had long been abandoned. It did have two distinct features, however. One was a vast, sprawling, multi-story palace, now in ruins, which gave the impression of a labyrinth. The second was a great quantity of double-headed axes and images of the same, known in Greek as labrys, from which we get the word labyrinth. We have no solid answer as to what these things meant. Some labrys (I can only guess labrys is both singular and plural; I’ve tried looking for something authoritative) are clearly functional, with long, strong handles and sharpened blades. Some however, are small, single-handed, decorative items that can’t possibly have cut through anything of note, suggesting ceremonial significance. 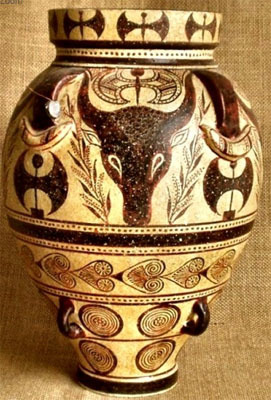 Reproduction of Minoan vase c1500 BCE, from Hellenic-art.com. They’re also featured in artwork as decorative patterns rather than in the hands of laborers or warriors, again suggesting ceremonial and symbolic value. But value for what? 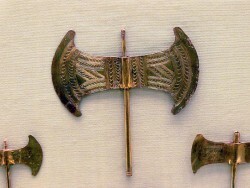 The Minoans were not a warrior culture. They had way too small a population to war with other major powers such as the Egyptian New Kingdom (the time of figures such as Hetshepsut, Ramesses the Great, and King Tut), the Mycenaeans, and the Hittites. Minoan artwork is also missing any significant images of war, unlike their neighbors, who clearly highly valued it. In both Minoan art and some neighboring cultures’ art, the labrys is sometimes paired with images of bulls. Bulls appear a lot in Minoans art in general, so they probably had cultural, possibly even sacred, importance. In that case, the labrys might well be a tool of ritual sacrifice, although that doesn’t really account for the decorative versions of the item. 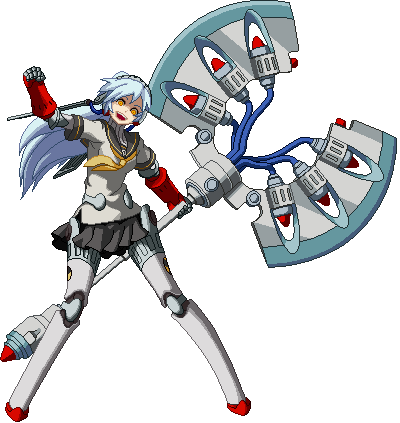 The labrys has been embraced in the last few decades by feminists and lesbians. The first reason is the pseudo-anthropological claims that the Minoans were matriarchal. Since we cannot read their writing, we really don’t understand their beliefs and social structures. The volume of female imagery does suggest women were respected in Minoan culture, but that’s a far cry from ruling it. The same pseudo-anthropological sources tend to teach matriarchal cultures worshiped a Great Goddess, a goddess who ruled all other deities or who might even be monotheistic. As such, you’ll run across references to all sorts of historical goddesses using labrys that don’t actually use them, and you’ll hear them referred to things like moon-axes, thanks to the longstanding tradition of associating women with the moon (because of the monthly cycle of menstruation, among other things). There’s also a variety of feminist and lesbian sources that credit the labrys to the Amazons, that ancient symbol of women living outside the control of men, stating Greek artwork commonly depicts Amazons with them. I’ve yet to find one. Amazons are most commonly shown with bows or spears. Oh, those Japanese. Anime and anime-inspired video games have a long history of borrowing bits and pieces of western mythology and throwing them into unrelated contexts. 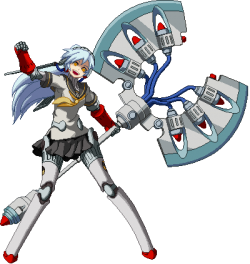 Thus, in the game Persona 4: Ultimate, we have a young lady named Labrys in typical anime garb (short-skirted school uniform) wielding the biggest damn double-headed axe known to man. She’s also associated with a character named Ariadne, who is the mythological character who gave Theseus a ball of string to find his way out of the labyrinth after killing the minotaur.